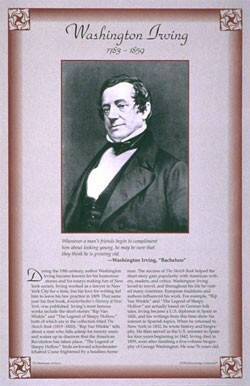 This unique educational poster features an artist's rendering of the great 19th century American poet Washington irving, as well as a quote from "Bachelors," and concise biographical text summarizing his life and career. 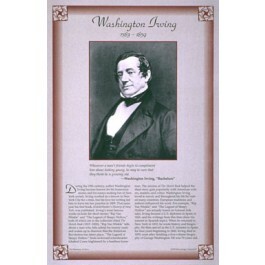 Washington Irving is best known for his short stories, including "Rip Van Winkle," and "The Legend of Sleepy Hollow." His success helped lead to the acceptance of the short story as an important literary form in America. This poster is a great way to introduce students to this important American writer.